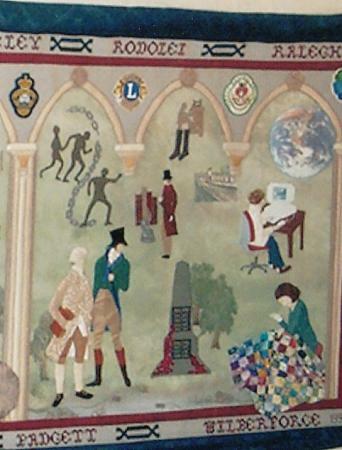 The textile wallhanging portraying Rothley's history was made by the Bradgate Sewing Circle for the Millennium. 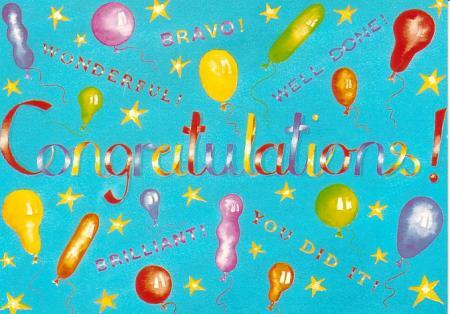 It was made possible by a National Lottery Grant and the 5% required by the group was generously donated by Charnwood Borough Council Arts Development Scheme, Rolls Royce of Derby, Rothley and Soar Valley Lions and Mr Ralph Hale. 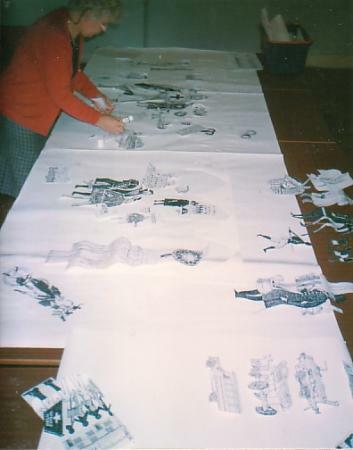 Bradgate Sewing Circle, who meet in Rothley, were approached by Charnwood Arts in March 1997 to apply for a grant from the Arts Council to produce a wallhanging for the village under the title 'Parish Maps'. 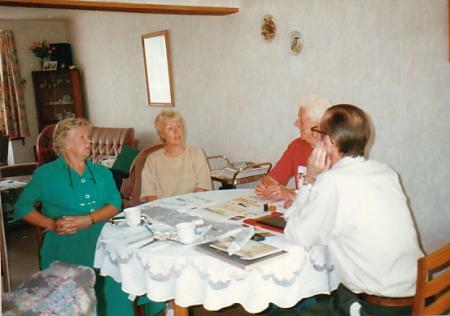 Their application was successful and it took many months for a sub-committee to research and plan with the help of local historian Rodney Offley and local artist Jan Welch. 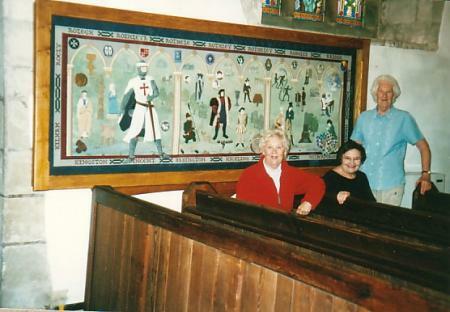 The hanging measures 9 feet by 3 feet 6 inches and was completed in 2000 and fixed in Rothley Parish Church in July 2000. Shown below is a record of work in progress. 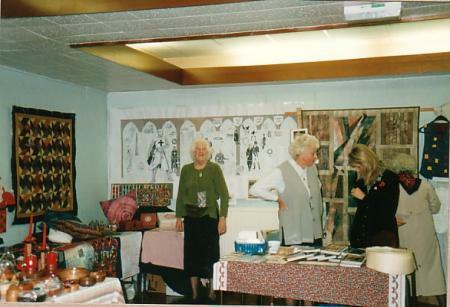 The aim was to produce a hanging which was pleasing to the eye, soft subtle colours, not too overcrowded, the spaces being as important as the figures etc. so that the eye could travel slowly and restfully through the story. Some of the items were placed under net, here again to give a more gentle look, and make them recede more than the others. The backing is the canvas-at first all the names had been worked on separate strips of canvas with a view to piecing them together to form a border, but this did not prove to be very successful as the people worked at different tensions. A whole piece of canvas was measured and the names round the sides were worked with the blank centre forming the backing. 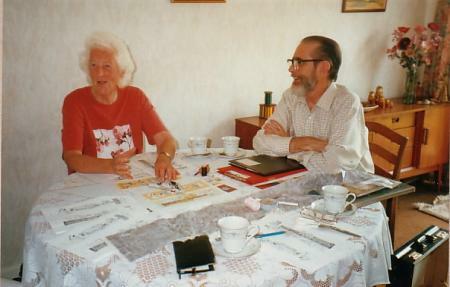 The background is calico which was painted with artist's acrylic paint, achieved by laying a large piece of polythene on the kitchen floor, placing the calico on top and painting with fairly large brushes. It was left to dry and then finally cut to size to fit the centre of the canvas back and tacked in place. 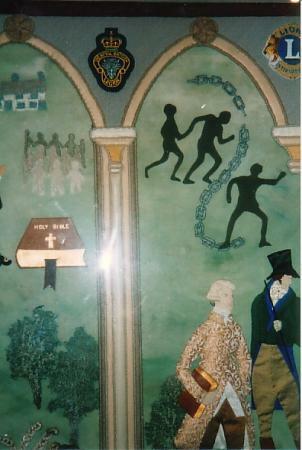 The arches were made as separate pieces by different people, the same colour as the background to the names, they were joined together and the rosettes placed over the joins. There are 10 different pieces. The arches are edged with leather, the capitals also have leather as well as canvas work, the pillars are leather edged in canvas work. When all these had been assembled the unit was laid on the background and the maroon border machined in place round the outer edge and hand stitched on the inner edge. Roman Coin-design marked on calico-layered with thin wadding and backing-worked in back stitch then coloured with Markal paint stick bronze and touched with gilt. Roman figure-cotton fabric-undergarment cream, toga yellow-beige, decoration chain stitch in royal blue, slippers brown leather. Burial pots-cotton fabric, slightly padded to give shape. Saxon brooch-design marked on calico, worked in backstitch then coloured with Markal paint stick gilt. Saxon Cross-design embroidered in embroidery cotton on a linen fabric, layered with thin wadding, painted with acrylic paints taupe, black and green. Church-free machine embroidery on water soluble fabric, grey and green thread. Font-hand dyed cotton fabric, running stitched to form channels in the design, which were then corded with quilting wool, again layered with wadding. Norman Lady-costume all cotton fabric-undergarment cream, dress blue, face and arms hand dyed cotton fabric. Templar Chapel-free machine embroidery on water soluble fabric, different greys. Templar emblem-all fabric paints embellished with embroidery threads. Trees-free machine embroidery on water soluble fabric. Hospitaler emblem-worked in French knots on calico, surround white leather, banner white leather. 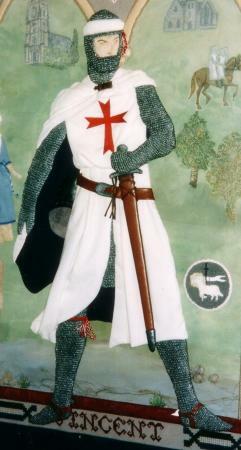 Knight Templar-design marked on a background of calico-lining navy placed first. Legs were worked in detached buttonhole stitch with Patons cotton perle in cream (no grey available) over low-loft wadding covered in grey cotton fabric. Painted when finished with Nerchau fabric pint-metallic black. All the chainmail was made in this way. The helmet is metallic black leather, the inside leg being the leather in reverse. 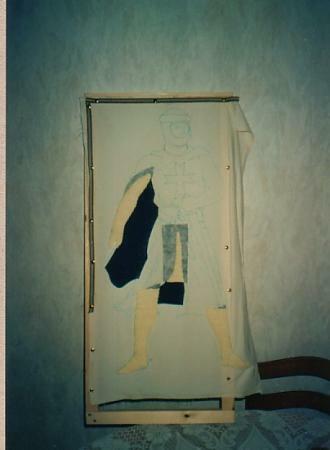 The skirt is draped to give the movement also the blouse part has folds to give the movement. The cross is machine embroidery with Madeira machine embroidery thread. Belt-leather. Sword cut out of plastic, the hilt wound round with crochet cotton and painted metallic black, the blade covered in brown leather. 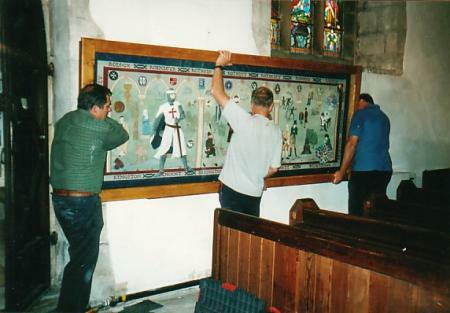 In this first section various items were placed under the net-saxon brooch, trees, Roman figure,burial pots, Norman lady, font, church, Templar chapel, Templar emblem, Hospitaller emblem. Rothley Brook across the bottom was painted as a separate piece with artist's acrylic paint, grey/blue, cut with a wavy edge which was fringed slightly to represent grasses along the edge. Threads which were the colours of weed in the water were used from a piece of chiffon which fitted the bill to perfection. These were lain down as though they were being taken along by the flow of the brook. Stones were placed in groups along the bottom edge, some under the net, some on top. The stones were made by taking a piece of stockinette (from tights) placing on top of calico stretched onto an embroidery frame. Uneven shapes were then drawn on the back of the calico and a backstitch worked round the shape then a tiny slit was made in the calico and then stuffed with wool clippings in a mixture of greys, browns, and a small amount of pink. This was achieved by clipping knitting wool so fine that it became fluff. Clumps of grass were also scattered along the brook. Leicester Abbey-free machine embroidery on water soluble fabric. Medallion of Henry V-hand embroidered in embroidery silks-Anchor. Prior of Leicester Abbey-this was originally made in brown and cream as it was thought the Order was Dominican, but later found to be Augustinian and they were dressed in black, but as the artist had advised never to use black or white (they were the two colours that the eye would gravitate to first) the figure was painted over with light and dark shades of grey. The shoes are brown leather and his beads wooden. Hair embroidered with mixed shades of brown and cream. The Park Ranger-suit dark green cotton fabric overlaid with strips of brown leather used on the suede side. face beige felt. Stockings beige knitted fabric (tights). Boots black felt. Deer-light brown cotton fabric, hand and machine embroidery. 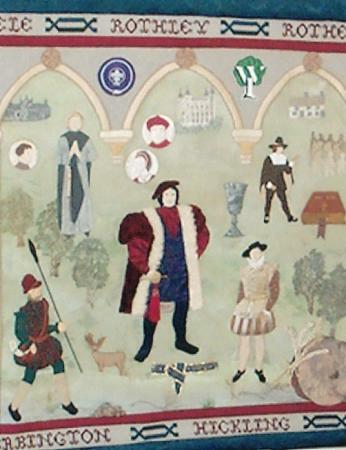 Tower of London-free machine embroidery on water soluble fabric. Medallions of Wolsey and Anne Boleyn-hand embroidered on cream background. Anne Boleyn embellished with tiny beads. Gold thread round the outside of both. William Kingston-navy blue undergarment in silk, dark red satin sleeves and under blouse coat dark rich silk velvet, edged in off-white fur. Stockings navy tights and shoes black leather. Order of the Garter-dark blue silk, embroidered in gold thread, edged in gold braid. Chalice-machine embroidered in grey thread on grey silk fabric. Schoolhouse-free machine embroidery on water soluble fabric. Schoolboys-marked on calico and worked in buttonhole stitch. Painted in acrylic paint shading from light to dark. Bible-made in leather, Holy Bible and Cross stencilled with gold paint, brown ribbon. Schoolmaster-hat leather, suit and cape brown cotton fabric lined with beige. Stockings made from tights, shoes leather, hands leather. Babington-brocade jacket, underskirt silk overlaid with ribbon strips. Sleeves ruched silk chiffon (readymade), shoes black leather, hat black satin. Mill wheel-hand dyed cotton, channels worked in beige cotton thread and corded with quilted wool. Sheaves of corn-plaited in embroidery cotton. Items in the second section under net: Leicester Abbey, all trees. medallion of Henry V, deer, Tower of London, medallion of Wolsey and Anne Boleyn, Garter, schoolhouse, boys, Bible. Slaves-brown cotton fabric, chain machine embroidery in silver machine embroidery thread. William Wilberforce-brocade coat over silk waistcoat, breeches silk, stockings stockinette and shoes leather. Babington-breeches silk, riding boots two different brown leathers. Undercoat blue silk and green topcoat wool material. Cravat silk with a tiny leaf pattern, stud a blue bead. Hand leather, top hat black satin. Riding crop a painted stick. Lord Macaulay-coat brown cotton, trousers beige fine twill, hat and shoes felt. Inkwell and books-combination of fabric and leather, machine stitched. Framework knitter-combination of fabric and machine embroidery. War Memorial-grey fabric machine embroidered. Poppies tiny circles of red silk attached with a French knot. Trees-these were made scrunching hand dyed muslin and attached to a background of green dyed fabric and then fraying the edges. The trunks were embroidered in brown stem stitch. Rothley Station-free machine embroidery on water soluble fabric. World from Space-printed on a computer printer fabric with inkjet computer printer. Slightly padded when put on the background. Student at computer-a combination of hand stitching and machine work using both cotton material and heavier fabric for the jumper. Design on the computer screen is a picture from a magazine under net. Patchworker-cloth dress, stool cotton fabric machine stitching, quilt made with nine-patch blocks, each square three quarters of an inch. Hands machine embroidered, quilting ring cane. Items in this section under net-slaves and broken chain, trees, framework knitter, station, world. Mothers Union-silk painted and outlined in gold cord. 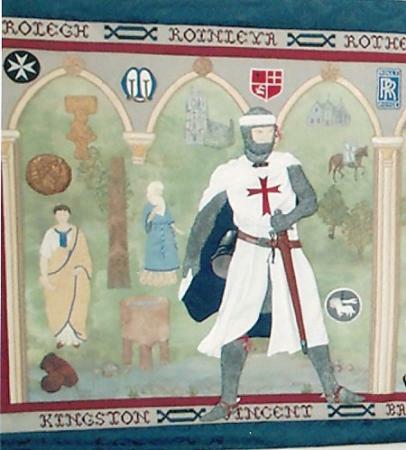 Rothley School-hand embroidered on silk. Rolls Royce-mainly machine embroidered, just a small amount of hand embroidery. Boy Scouts-actual badge mounted on purple silk and white cord placed round. Womens Institute-white leather on green silk, machine embroidered round edge and a small amount of hand embroidery on the face. 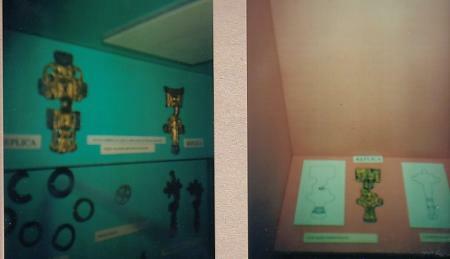 Rothley and Soar Valley Lions-blue leather in the centre, white leather L, surrounded by gold thread. Lions and International hand embroidered on beige silk. Lions heads hand embroidered. Great Central Railway-all hand embroidered. 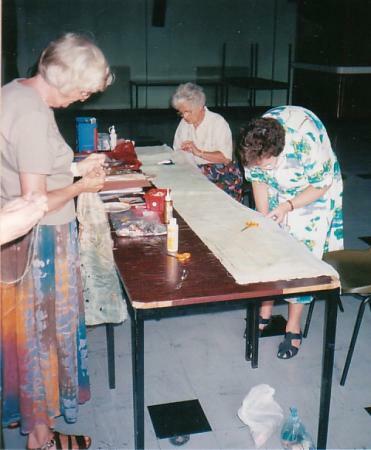 Bradgate Sewing Circle-seven sections of different coloured silks, the name embroidered gold thread. Finally, Congratulations to the members of the Bradgate Sewing Circle who worked on this project for such a brilliant contribution to the History of Rothley. Knowing how much work went into this project I felt that a record should be kept of how it was achieved and the amount of dedication that was shown by those involved. Also, if this is still on the internet for the next Millennium it might inspire other villages to record their history in fabric.